For the past year or so I’ve been acquiring used sanke kegs with the goal to convert them into kettles, or “keggles” as they are commonly called. I currently have four… one in excellent condition, two in fair condition, and one with a big hole in the bottom that I did not notice until I had already gotten it home (will probably be turned into a table or stool eventually… currently acts as a stand for my cooler mash tun). I’ve been using an 8 gallon kettle ever since I took my brewing outside, and a brew day hasn’t gone by without me regretting this purchase. Taking into account boil off, 90 minute boils when using pilsner malt, and any batch size slightly greater than 5 gallons, I usually have this kettle filled to the very top, and always end up with some level of boil over. The keggle seems to be a great option for me. It holds 15.5 gallons so boil over is not much of an issue, and it allows me to move up to 10 gallons batches for those “house” beers you always want to have on tap. It also has that DIY element to it that I enjoy, and personally I think they look really cool. Did I mention I’ve been storing these in my garage for over a year now? Here’s my issue. I’m lazy. Obviously there is some work involved to convert a piece of stainless steel designed for holding finished beer under pressure into a big pot… the most obvious task involving cutting a hole in the top. I’ve researched this topic to death… bought an angle grinder and stainless steel cutoff wheels and have the plans for a simple, but tried and true jig for cutting a perfectly round hole. Still, here I am blogging about it rather than being out in my garage cutting the hole. This brings me to this morning, and ultimately the question I have for any of you who read this. On my way to work, I passed by a welding shop in my town that I had not noticed before. This got me to thinking if it would be easier (and cost effective) to just bring them the keg and have them cut the hole with a plasma cutter. I honestly have no idea what the charge would be for something like this, but the simplicity of it is very appealing to me right now… as well as the thought of being able to brew my next batch in a keggle. Do any of you have advice as to which way I should go (DIY angle grinder vs professional plasma cutter)? This also begs the question that since I would be bringing them the keg anyway, would it be better to have them weld on the connections for the valve, thermometer, sight glass, etc, or just use the weldless fittings I was already planning on. Again, any advice would be appreciated. It has been months in the making, but I finally got around to using a pound of leaf Citra hops that I bought back in March. There were a lot of firsts for me with this beer. 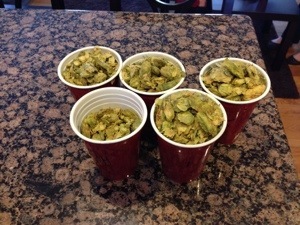 First time brewing an IPA, first time using leaf hops, and first time using grain from my bulk purchase. Yes, I recently participated in my first group grain buy. I bought a 50lb sack of premium 2 row and a 55lb bag of Maris Otter. For this recipe, I was putting the 2 row to work. 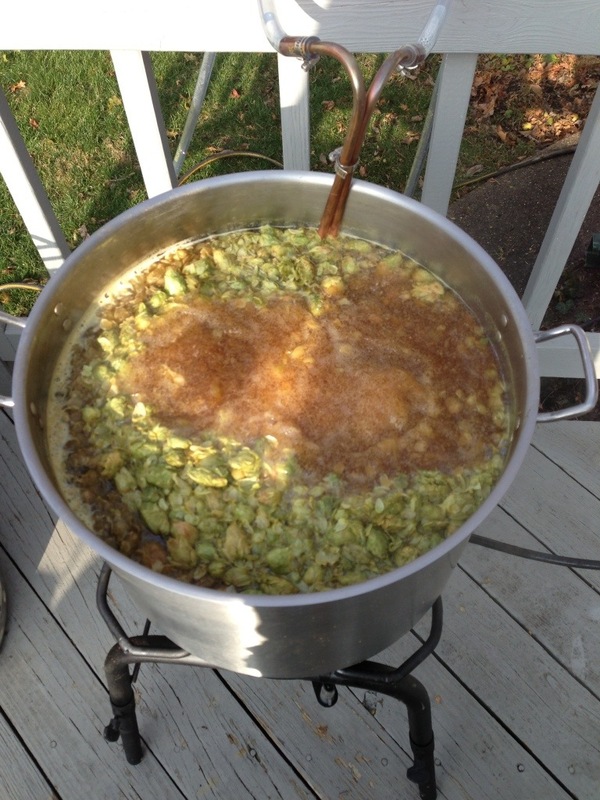 The inspiration for this brew day comes from 3 Floyd’s Zombie Dust… A Citra only (at least the original recipe was) pale ale with a ton of Citra flavor and aroma, but not an overpowering bitterness. To achieve this, I figured the bulk of my hop additions needed to be very late in the boil, and due to the fairly high alpha acid % of Citra (13.4% on the pound I had) I wanted to temper the early additions to make sure the IBUs weren’t over the top. I decided to go with 5 additions, and used First Wort Hopping to maximize the flavor I was getting from that early addition. the additions were .75oz FWH, 1oz at 15min, 1oz at 10min, 1.25oz at 5min, and 1.25 at 1 min. The grain bill for this beer was fairly straight forward: 11 lbs of 2 row, pound of Munich 10, half pound of Crystal 60, and a half pound of Melanoiden malt. The Melanoiden was new to me, but I had read in a few forums that the consensus out there is that FFF uses it in a number of their beers. It is supposed to impart a full malty flavor without greatly affecting the grain bill. The mash was fairly non-eventful, 152 degrees for 60 minutes. Got a stuck sparge a couple times, but all in all it went really well. I loved smelling those FWH Citras as I was pulling the first runnings. It felt strange not adding any hops at the beginning of the boil, and actually made the first 45 minutes of the boil kinda boring. I kept myself busy sterilizing the fermenter and other tools, and treated myself to a New Belgium Ranger IPA. I had a bottle of Zombie Dust available, but I’m waiting to use it as a comparison when my version is ready to drink. 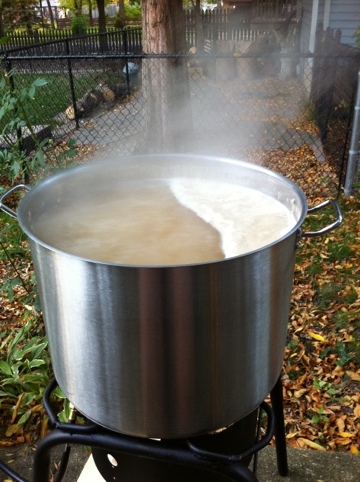 Finally I was at 15 minutes left in the boil, and it was just non-stop hop addition time. By the last addition, it was getting pretty crowded in the kettle. 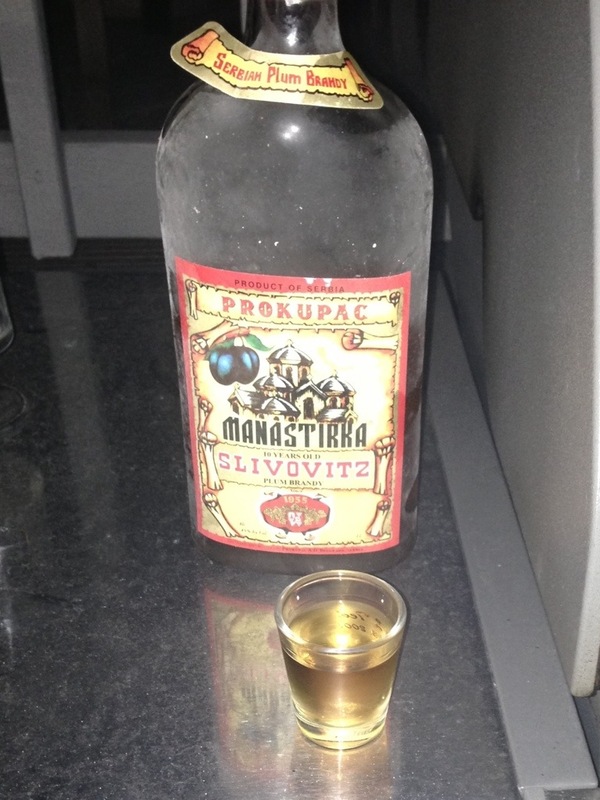 The smell at the end was incredible… Almost like fresh grapefruit juice. Straining the wort out was a lot more tricky with all of those leaf hops, but with a little help from my 7 yr old, I got a good solid 5 gallons in the fermenter at 1.062. I kept the yeast simple, and pitched two packets of rehydrated S-04, along with a healthy dose of oxygen. 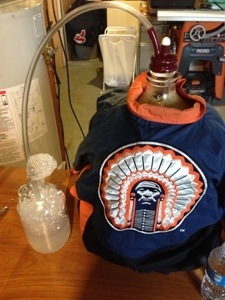 Fermentation was evident within 6 hours, and 18 hours later I switched out the airlock to a blow off tube. Good thing I did, because that krausen got within a half inch of blowing off in my 6.5 gal carboy. But wow… The smell was amazing. From here I’m expecting fermentation to be done in 7-10 days. 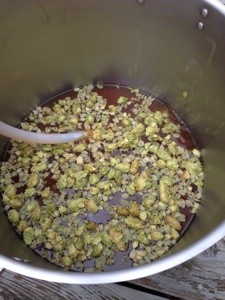 Then I am going to rack to a keg and dry hop with another 3oz of Citra for 7 days. I’ll be back once it’s ready to drink with some tasting notes! Cheers! It’s always a little depressing when you remember that you have a blog and realize the last posting was for New Years… and here we are in October. Oh well. I’m at work, so I really don’t have the time to blog about anything interesting. Really haven’t brewed as much this year as I would have liked to. The summer was way too hot. However, with Fall in the air, I have been much more motivated lately. Currently have a Saison and Pumpkin Ale that are ready to be moved to kegs, and I have a few recipes I’ve been throwing around in my head. Oh, Julie and I did make it to the NHC in Seattle this year. Absolutely amazing time. 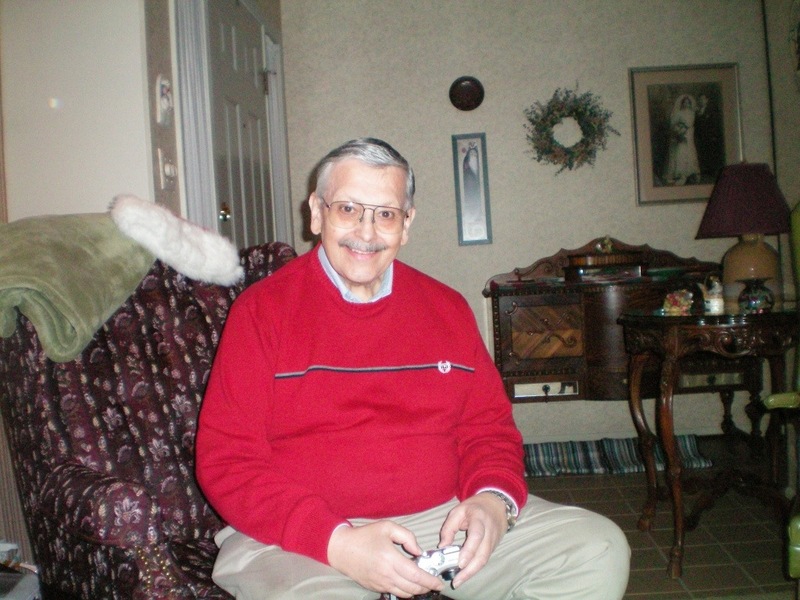 When I have a moment, I will do a NHC summary post complete with some pictures. NHC is where Julie and I acquired our addiction of sour beers… we tried so many different varieties… it was awesome. Currently trying to put the equipment together so I can start brewing some sours myself. Seattle itself was amazing. I think Julie and I found our next place of residence. Ok, that’s it for now… hopefully I will remember that I have this blog and makes some posts before 2013! Cheers! 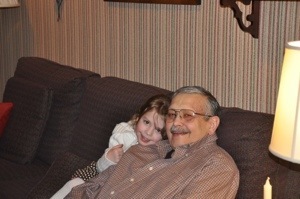 Welcome 2012! While personally 2011 was a pretty rocky year, I can’t ignore the fact that it was also the year that I got back into homebrewing, and learned more about this magical process of brewing beer than I would have ever imagined. My total for 2011 came in at 75 gallons brewed. I only repeated a few recipes, so it came out to be a total of 12 different styles brewed. I only bottled my first batch, and quickly moved to kegging. The year began with partial boils on the stovetop, then to full boils on the stovetop (my apologizes to my wife for the slight damage to the stove grates), and now to full boils outside. I also made my switch to all-grain brewing about halfway through the year. 2011 also marked the first time I entered a BJCP-sanctioned homebrew contest. While the marks I received on my Weizenbock were nothing to get excited about (avg came to 25), the great feedback on the judging sheets was so helpful. For example, one of the comments was that it needed more body for that style. So I did my research and learned that your mash temperature can make a big difference on the body. Up until then, I had just been taking the mash temperature given to me by my Beersmith software. When I brewed my Bust a Nut Brown Ale recently (sorry, never made a post about this one…) I mashed at 158-159… much higher than my usual 152. The difference was incredible. A lower ABV than most of my previous beers, but with a great mouthfeel. This is what I love about this hobby. There are so many little variables you can tweak and experiment with. So what’s in store for 2012? I have lots of ideas, so we’ll have to see how many get implemented. High on my list is moving to 10 gallon batches. I’ve acquired kegs to be transformed into keggles, and right now am looking into the Blichmann Top Tier system as my brew structure. Also, I have a window unit air conditioner in my garage that I’m planning to use when building a larger fermentation chamber in the basement. I want to move to using yeast starters this year, and finally building out my keezer. As far as beers go, I NEED to do an IPA since I’ve been addicted to them recently. However, my creative side has me itching to try some classic english style ales, but using Belgian yeast strains. Also, thanks to some input from the head brewer at Lunar Brewing Company in Villa Park, IL, I will be trying a variation on the Raspberry Cream Ale I did this fall. 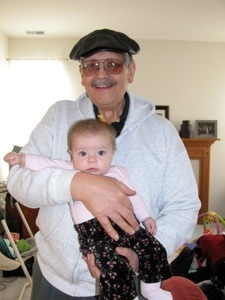 And by far my favorite plan for 2012, my wife and I will be heading to Seattle for the AHA conference in June! Like I said, my list is long, and that’s only a few things I have floating around in my head! Well I hope you had a great New Year, full of great craft and home brews! Cheers! This brew day started just brewing another batch of BierMuncher’s (from HomeBrewTalk.com) Cream of 3 Crops Ale. It’s a popular beer in my house, so I need to start a new batch before the keg kicks. Overall the brew day went well. Had one stuck sparge, but was able to work through it. Pre-boil gravity was a couple points higher than expected, and the boil-off rate was also higher, so I added three quarts of water with 30 minutes left in the boil. Ended up with an original gravity just two points higher than expected, so I’ll take that as a win. The following Friday my wife and I were enjoying a few beers at our local brew pub, Lunar Brewing Co., and we started talking about how much we liked their Raspberry Cream Ale that they had on tap over the summer. Then I remembered I had a batch of Cream Ale fermenting at home. Maybe this batch was destined to be racked over a crapload of raspberries? Absolutely! 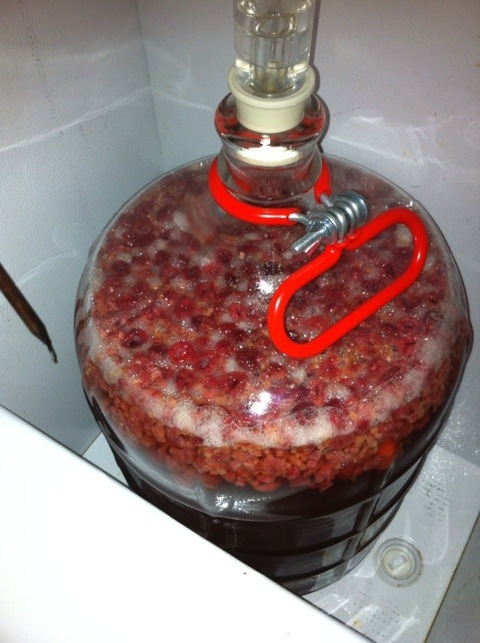 Picked up a large bag of frozen raspberries from GFS and added about 3.5 lbs of thawed berries to a sterilized carboy before racking the Cream Ale on top of them. Gravity before racking was 1.010. Within 24 hours there was significant airlock activity and the berries were beginning to turn white. At this rate I may be racking to keg by the end of the week. Lunar’s Raspberry Cream Ale had a very distinct raspberry flavor and aroma, but was not sweet. A tartness/bitterness that melded well with the slightly hopped base. I did not get the impression that it was back-sweetened in any way, so I will not try that with my version. The notes they had on their menu made mention of a slight vanilla finish. Personally I never really picked up on it, so I will not be doing anything to impart that flavor either. If you want the recipe, please feel free to grab BierMuncher’s original one here. I’ve made a few changes in ratios when scaling it to 5 gallons, but in essence it’s the same recipe. As soon as I have a chance, I will link the recipe from Beersmith to this posting. Tasting notes to follow! 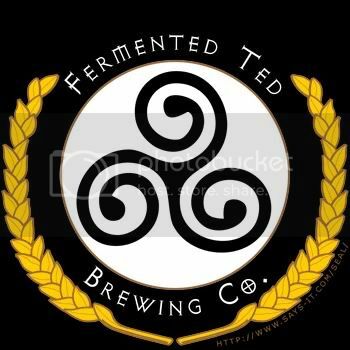 Hello, and welcome to the home of Fermented Ted Brewing Company! Never heard of us before? Yeah, that’s probably because there’s no such thing… it’s just the name I gave to the obsession that is my homebrewing hobby. I first started homebrewing in college back in 1995. It was the result of my roommate and I being underage and trying to figure out ways to score alcohol. We decided to ferment apple cider in glass, 1-gallon jugs in our dorm room, using bread yeast and filtering the end result through coffee filters. While the process was far from sanitary, the end result was actually pretty good, and was rapidly consumed by our friends (I personally refused to drink it myself). A couple years later my parents sent me a Mr. Beer kit. I brewed up every recipe I had and they all turned out very well. But the task of cleaning everything up, particularly the bottles, was far too demanding at the time, and I let my interest slip away. Thirteen years later I read a Facebook post of a friend who was homebrewing down in Austin, TX. Everyone was commenting on how great the beer turned out and I starting thinking back to the fun I had with my Mr. Beer kit in college. After some questions to my friend, and research online, I went ahead and ordered a homebrew kit from Austin Homebrew Supply. After brewing that first 5 gallon batch, I knew I was hooked and haven’t looked back since. In just 8 months I have brewed twelve 5-gallon batches, and have transitioned from extract brewing to all-grain with a kegging setup. While I feel like I’ve learned a lot over the last 8 months, there is so much more for me to experience. I have learned the most from reading posts at homebrewtalk.com and other homebrewers’ personal blogs, and thought that it’s only fair that I contribute back by blogging about my personal experiences as well. While the design of my blog is still somewhat of a missmash in my head, I expect to include topics such as equipment and ingredient reviews, DIY equipment projects, craft beer tasting reviews, and of course my actual brewing experiences. Oh, and just a quick note about me… I love feedback. If you are looking for something here and don’t see it or the information is not clear, please let me know. I am always interested in improving what I have and making the blog better. I hope you find something interesting here eventually! Cheers!